Although the man-lizards of Venus in H.P. Lovecraft’s “In the Walls of Eryx” may somewhat appear to be related to reptiles of Earth, Lovecraft clearly understood that they are not true reptiles when he occasionally referred to them as pseudo-reptiles. 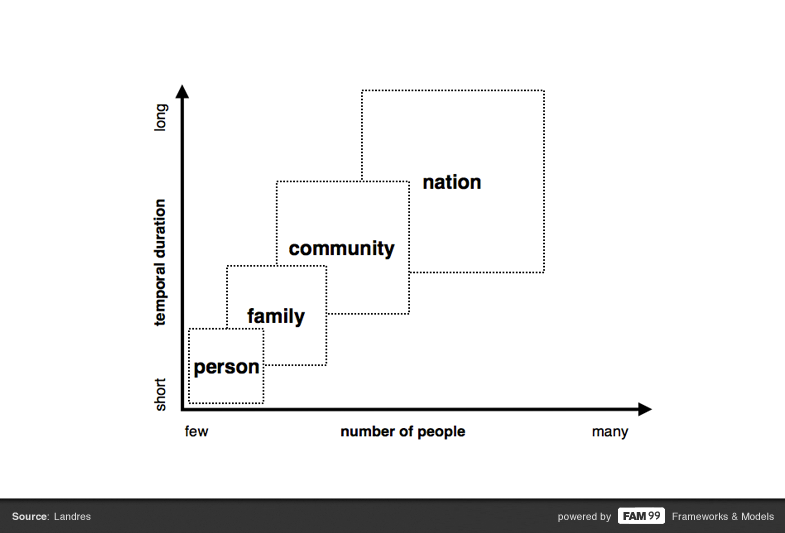 However, we tend to categorize objects and organisms within the context of our own experiences and knowledge. Thus, the closely related thing these semi-anthropoid like beings represent are reptiles. The man-lizards are known to live in communities of cities similar to ant-hills or beaver-dams that are typically adjacent to sources of water. Thus, living underground and/or near water probably keeps the man-lizards cool in the hot Venus climate. 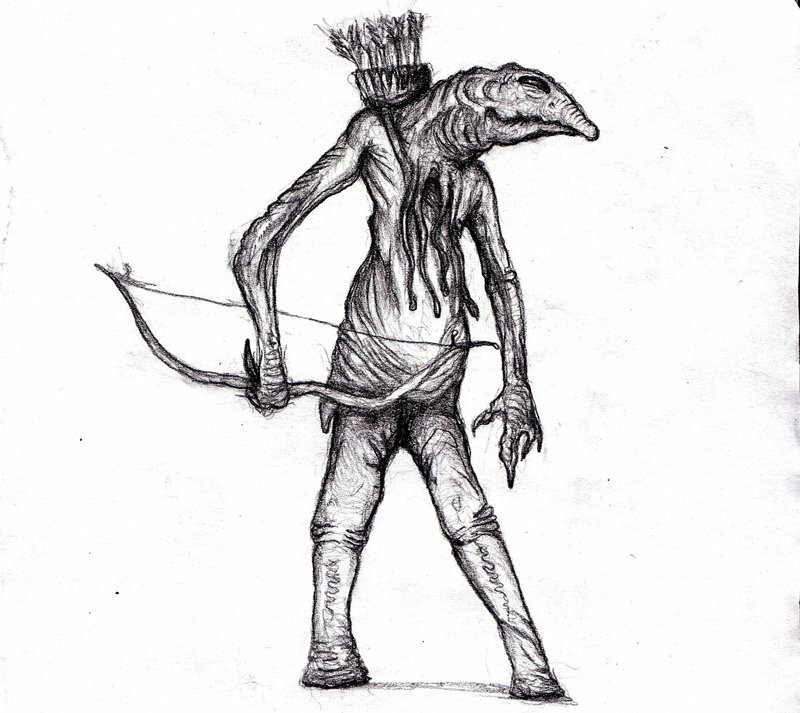 The technology of the man-lizards appears to be limited to swords and poison darts, however, they do use their technology effectively through actions of sabotage associated with damaging human water pipes and other associated infrastructure. Based on their organized cities, the man-lizards would range fairly high on a cultural scale (see below). However, in spite of their cultural status, their technology and proposed mode of communication through the use of the tentacles, Kenton thought of them as little more than animals that should be wiped out so the crystals could be harvested and mined with no native interference. However, through the course of the tale Kenton’s attitude toward the man-lizards changes. At one point when he is trapped in the invisible maze a group of the man-lizards come out of the jungle and watch Kenton in his situation. Based on Kenton’s observation his doubt over the theory that the man-lizards communicate through the tentacles on their chests is squelched. In fact, based on their apparent communications the man-lizards seem amused over his situation. It is apparent that the large crystal placed in the invisible maze was a trap, designed to lure and trap humans, using their own greed as the instrument of their doom. As Kenton runs out of his supplies of oxygen, food and water more of the man-lizards show up to mock him and laugh at his predicament through a high degree of agitation of their tentacles. In the end Kenton has a dramatic change in his philosophical viewpoint on Venus. Instead of thinking of it as a natural resource to be controlled, dominated and harvested by humanity, he thinks the planet should be left alone. This theme of coming to realize that the natives of a foreign land are not mindless savages but are intelligent and highly adapted to their endemic ecosystem, of colonialism to one of understanding, has frequently been observed in both history and fiction. Many of the accounts of Charles Darwin associated with his voyage on the S.S. Beagle included the realization that endemic people’s customs and societies may seem primitive to use but have been developed with the long-term means of adapting to their environments to be successful from an evolutionary basis (that is, lead healthy lives and see their population thrive and grow). 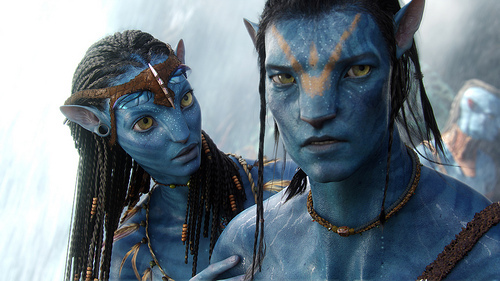 In addition, as previously mentioned, I am surprised how much “In the Walls of Eryx” closely parallels some of the themes and ideas in James Cameron’s movie Avatar (2009). Frequently the inspiration for Avatar is the 1990 movie Dancing with Wolves, which Cameron freely admits. 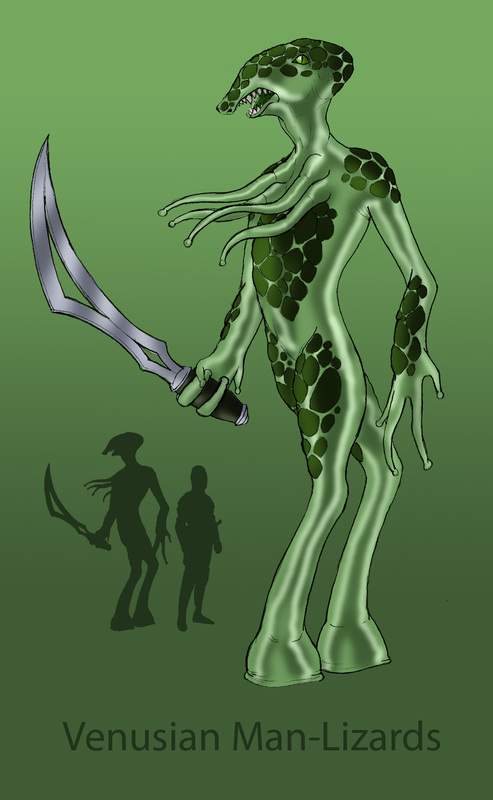 However, many of the themes – the harvesting of a crystal or element that is an extremely high source of energy, a strange alien world including a detailed account of their resident plants and animals and the realization that the mindless savages are actually a race of highly intelligent beings – that are in “In the Walls of Eryx” are also found in Avatar. It makes one wonder if Cameron read “In the Walls of Eryx” himself and if this tale was another source of inspiration for his sci-fi epic. One concluding thought, a number of times in “In the Walls of Eryx” there are references to an ancient civilization that may have lived on Venus; a highly-evolved race of beings that either died out or are possibly still living deep inside of Venus, possibly under the Dionaean Plateau where mysterious caverns have been found. Another hypothesis is that the man-lizards may be the decedents of this advanced yet extinct civilization. Whichever of these hypotheses is true, more than likely the invisible maze of Eryx was built with technology far beyond the man-lizards. However, the current inhabitants of Venus certainly knew how to use this ancient, yet advanced technology, to their advantage. Next time we initiate a discussion of “Herbert West – Reanimator” just in time for the month of Halloween. Thank you – Fred. Last time we reviewed the flora of Venus in H.P. 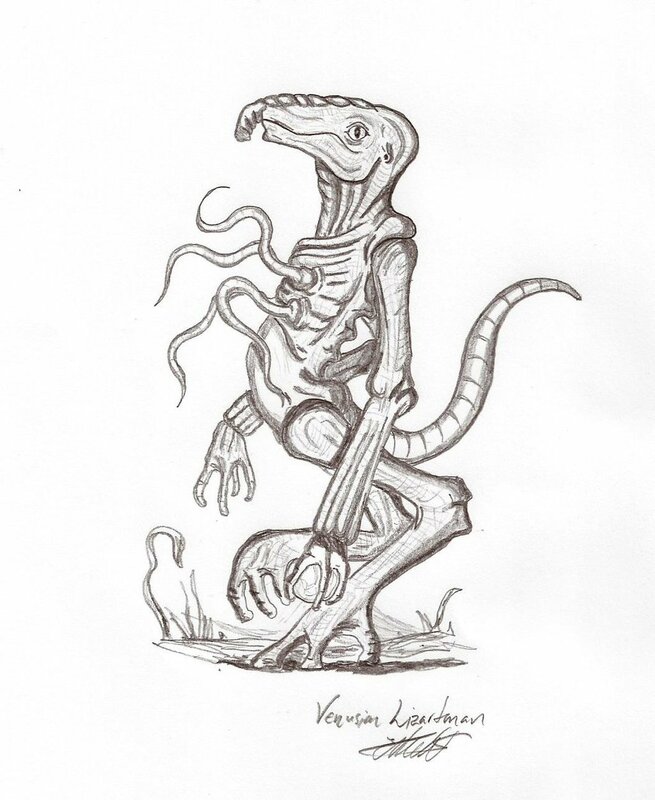 Lovecraft’s “In the Walls of Eryx.” In this article we will review the fauna of Venus. As previously mentioned, rates of decomposition on Venus are extremely high, partially due to its high humidity and temperature. Decomposition appears to follow a specific succession of biological processes. 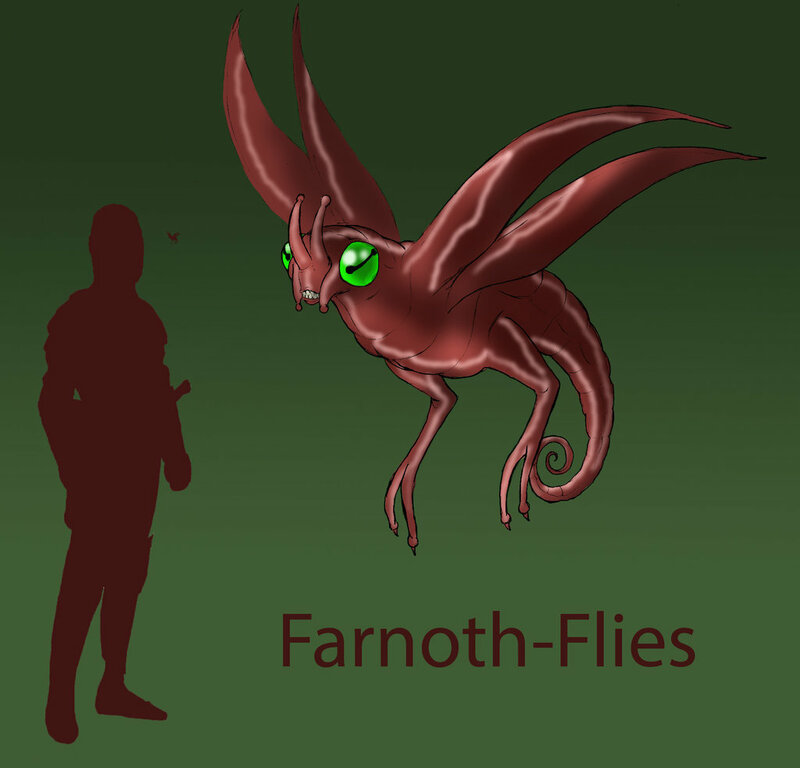 The corpse first attracts the farnath flies, which are later followed by the sificlighs and the wiggling, slimy akmans. These animals directly feed off the dead biomatter, tearing off chunks of flesh and organs to consume. This breakdown and tearing apart of the biomass increases the surface area of the material, allowing the resident microbial and fungal species, as well as the farnath flies, to continue this process of reducing the size of the biomass. Additionally all of these organisms may exert or produce compounds that aid and accelerate the rate of decomposition through purification. Thus, by the time the efjeh-weeds appear not much is left other than bone and some residual biomatter. 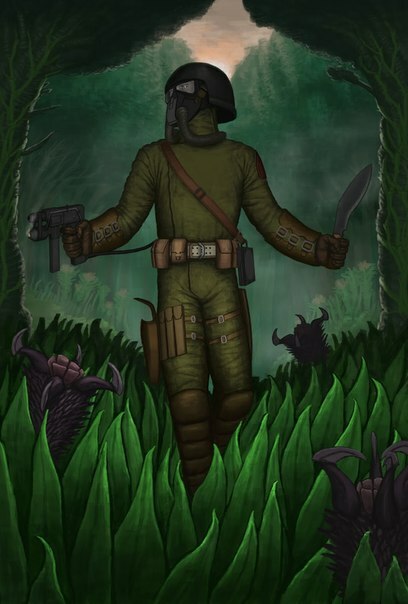 With very little organic matter left the efjeh-weeds begin to break down the leather of the environmental suits. A very similar succession of decomposition occurs on Earth, largely dependent on season and temperature. Thus, rates of decomposition are generally faster in tropical regions when compared to temperate regions, which in turn, are faster than those to polar regions. Thus, the high humidity and temperature throughout most of Venus results in very accelerated rates of decomposition. Venus is not just filed with necrophagous organisms and decomposers. Predatory skorahs have also been identified. 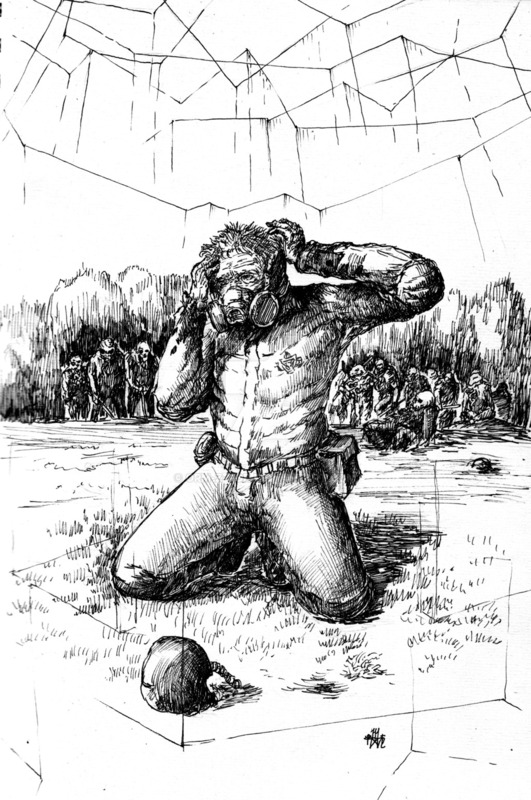 In the tale as the protagonist is trapped within the invisible maze he observes the body of a fallen comrade being converted into a “writhing mass of vermin…” He hopes the odor will attract carnivores such as the skorahs who would then wiggle through the maze so he could find a way out. Unfortunately for him this did not occur. The last note made of the skorahs was that in addition to being carnivorous they tended to function in aggregations, working in groups or packs to bring down prey considerably larger than their individual selves. Another animal mentioned in “In the Walls of Eryx” is the flying tukah. 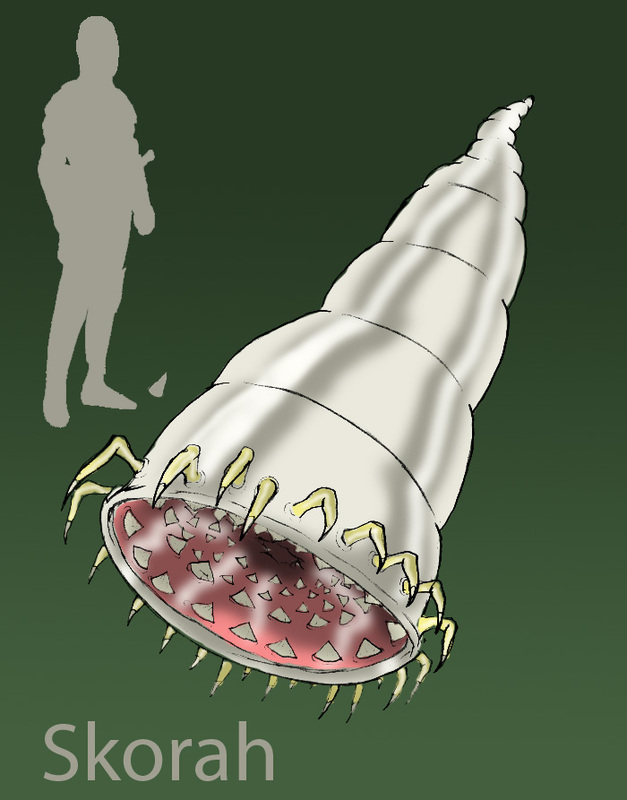 This organism is only mentioned once in the tale and it is identified as one of the few higher forms of life that is found on one the other continents of Venus. Other than that, little is known of the flying tukahs. The only other animal life on Venus described in a higher degree of detail were the man-lizards, the sentient natives to this world and we will discuss this race of beings in the next article. Thank you – Fred. 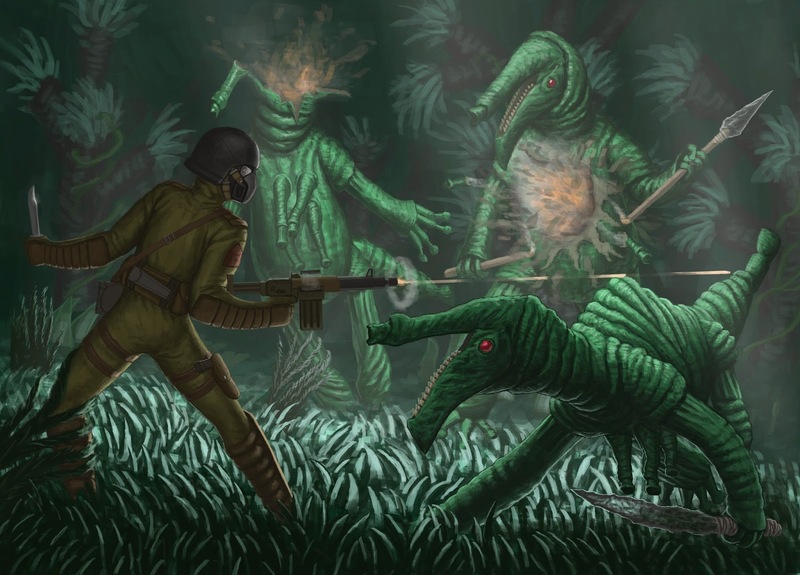 Lovecraft and Sterling describe Venus as a world of steaming fens and jungles in the tale “In the Walls of Eryx.” The most sentient and “dominant” species on this world are some “man-lizards” who have a fairly primitive society. We will come back to the man-lizards in a future article; however, this article focuses on the endemic flora of Venus, with another to shortly follow that focuses on the fauna of Venus. As noted throughout the tale, the dominant ecosystem on Venus appears to be tropical jungles. Thus, before we begin to talk about the endemic life on Venus let’s first briefly describe the Venus biosphere. First, since Venus is closer to the sun than Earth and it has a heavy cloud cover, its global temperature would by higher than Earth’s. Venus is an extreme case of global warming; runaway greenhouse effect. The cloud cover filters out some wavelengths from the sun but allows other in; at the same time the cloud cover prevents a certain portion of the electromagnetic spectrum, specifically the longer wavelengths such as the reds and the infrareds, from leaving the planets’ atmosphere. Infrared radiation, which is invisible to humans, is essentially thermal radiation (heat), resulting in the warming of Venus. The high amount of red (light) and infrared radiation in the atmosphere of Venus was noted by Lovecraft in passages such as “…in the reddish rays of the weltering sun.” and “….the sun was sinking very low in the west – a golden-ruddy disc floating in a pool of scarlet and orange above the mist-clouded trees of the horizon.” However, it should also be noted that the sun would not sink in the west on Venus; it’s one of the few planets that rotates clockwise on its axis. Thus, the sun would sink in the east not the west. In addition a Venusian day is slightly longer than a Venusian year so the sun would pretty much remain in the same position throughout the tale. 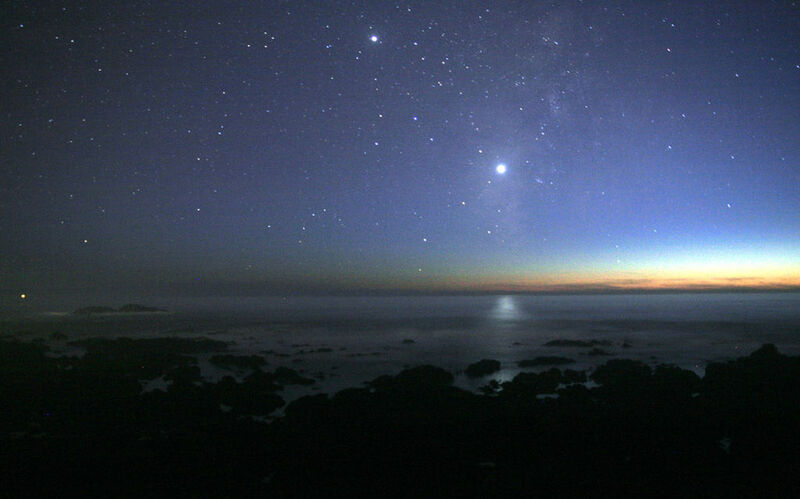 In any event the result of these conditions is a warmer world; however, in spite of being closer to the sun than Earth, Venus would be a darker, dimmer world with a lower amount of light reaching the surface. Again Lovecraft notes a number of times that the world has a misty or twilight-like appearance. These lower levels of light but the higher amounts of reds and infrareds have a profound influence on the plants and animals that have evolved on Venus. First, high temperatures and humidity means high rates of decomposition and this was noted by Lovecraft. Second, the lower light levels means the resident vegetation more than likely uses the reds and possibly infrareds for their version of photosynthesis. 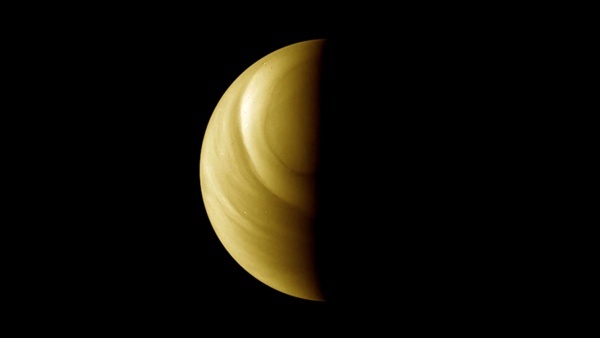 The vegetation may still have a greenish appearance for the small amount of green that enters the Venusian atmosphere. However, Lovecraft did note that some of the flowering plants were “… shifting in colour and getting wraith-like.” This shifting of color may be some type of adaptive photosynthesis where the plants modify their “light capturing” pigments to maximize their uptake of light energy. A side-effect of this may a shifting or changing of their color. The “wraith-like” appearance may be plants reflecting infrared radiation (heat) so to us it would make the plants look “ghostly” and semi-disappear since infrared radiation is invisible to the naked human eye. Obviously, using thermal-imaging cameras would be a way of testing this – if the wraith-like vegetation show up on thermal-imagining like we do (since we generate heat) it would support this hypothesis. With this background in mind, let’s review some of the Venusian flora. Some of the Venusian vegetation looks similar to that found on Earth (both living and extinct). For example, some of the plants appear to be very similar to angiosperms (flowing plants) while others are similar to low-lying mosses. 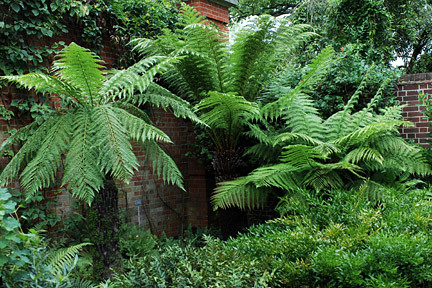 Tree-ferns were also noted on the broad mossy plateau called the Erycinian Highland. Essentially a fern with a trunk elevating the fronds above the ground is considered a tree-fern (of the order Cyatheales). Not surprising, these plants tend to be found in tropical and subtropical regions on Earth. Some of the extinct (at least on Earth) plants that were identified on Venus include Lepidodendrons, which are vascular tree-like plants that are sometimes compared to club mosses but are more closely related to quillworts. Ugrats – a general term for carnivorous plants. If one is not aware or highly mobile the flowering heads of these plants still attempt to feed on any organic material it is in contact with. Efjeh-weeds – a vine-like plant with necrophagous feelers, which means it generally feeds on dead biomass. Based on the observations made in the tale, these weeds may function more like an aggressive form of fungus rather than a plant. The weeds appear and feed off the remains of dead organisms after most of the resident animals have fed on the bodies. The efjeh-weeds also appear to feed off of organic material in general such as leather. Thus, it is hypothesized that like fungi, these weeds excrete exoenzymes to help digest and break down organic matter, to then be assimilated for energy. Mirage-plants – plants with shaggy stalks, spiky leaves and mottled blossoms. These plants emit a gas that results in “dream-breeding.” I hypothesize that this dream-breeding is in reference to putting a victim to sleep then using the individual’s body as a platform for pollination or possibly as a means of transportation to another plant (as the individual wanders off in their hallucinogenic haze) for pollination. In addition to emitting a hallucinogenic gas the Mirage-plant also produces bioluminescence, which probably attracts animal life. This bioluminance appears to increase in frequency and magnitude as an animal approaches and then declines as they walk away. Indeed, bioluminescence of the Venusian vegetation is probably fairly common, again as a means of attracting prey and/or pollinators in the dim and misty light of Venus. Thus, the appearance of bioluminance is probably strongly correlated to temperature and/or light. To summarize, the low light levels on Venus have resulted in alternative adaptive strategies of its endemic vegetation such as predation and saprophagous feeding. The next article will be a discussion on the fauna of Venus. In addition, sometime over the next few days I will post a guest article on the Flying Polyps. Thank you – Fred. “The general ignorance of the public as regards the science of astronomy has often been noted and deplored.” This quote was the opening sentence in an article H.P. Lovecraft wrote for the Providence Sunday Journal (26 December 1909), called “Venus and the Public Eye.” Lovecraft goes on to say that in the early evening on Christmas Eve 1909 in the business section of Providence a number of people were looking at something in the sky. Initially Lovecraft was very pleased that they were observing the brilliant beauty of Venus; however, it turned out they thought they were looking at an airship owned by a local merchant, a Mr. Wallace E. Tillinghast of Worcester, Mass. When Lovecraft corrected them that the light was in fact the planet Venus the result was only mild surprise (Collected Essays, Volume 3: Science by H.P. Lovecraft, edited by S.T. Joshi, 2005). One gets the impression that the observers were disappointed that the light turned out to be Venus and Lovecraft was disappointed that the group were not excited about observing Venus. Venus has always been considered the sister planet of the Earth since it is similar in dimensions, gravity and density. Obviously being closer to the sun it receives higher amounts of light and heat. 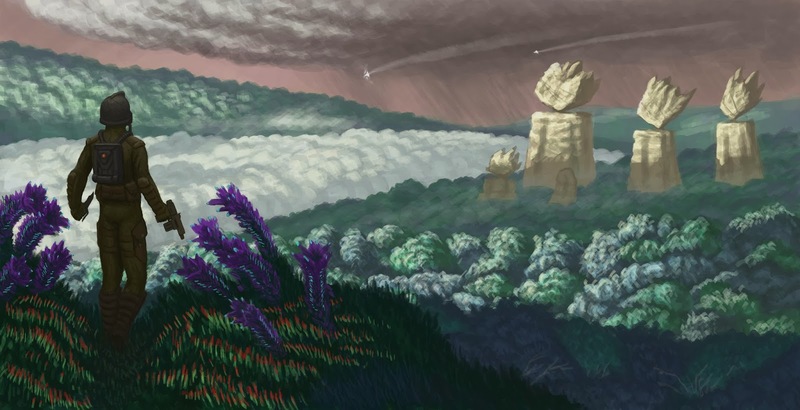 Details about the planet’s surface were minimal in Lovecraft’s day due to the extensive cloud cover. Given its similar size to Earth, closer proximity to the sun and cloud cover, the possibility of life on Venus in Lovecraft’s day was real. Many thought of Venus as a hot, steamy jungle world, filled with a wide array of vegetation and perhaps fauna similar to that of the dinosaurs of ancient Earth. Lovecraft did hypothesize that any inhabitants of Venus must rarely see the heavens due to the extensive cloud cover but when their sky was clear “…our terraqueous globe must shine in the heavens of Venus as a brilliant planet, having motions like those of Mars as seen by us” (S.T. Joshi, 2005). 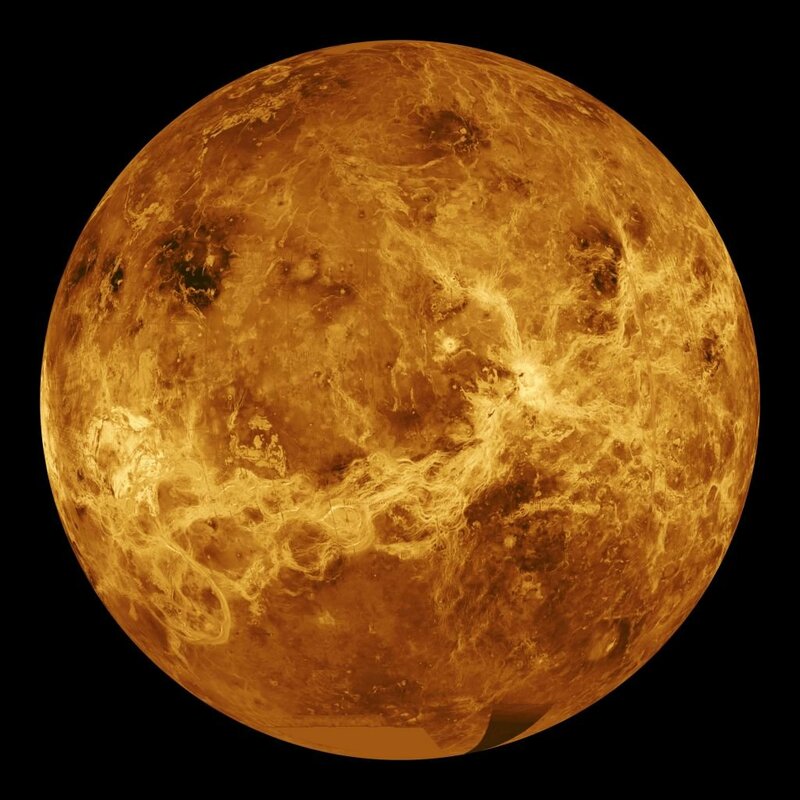 Radar image of the surface of Venus by the Magellan spacecraft (www.blogs.esa.int). It would not be until 1962, 25 years after Lovecraft’s death that the first probes would visit Venus. The Mariner spaceflights by the US and the Venera and Vega spaceflights by the USSR collected a wide variety of data both orbiting the planet and on the surface. Venus is a world with high temperatures (surface temperature of 475oC) and pressures, with an atmosphere rich in carbon dioxide but also containing nitrogen and oxygen. Thunder and lightning have been detected on Venus as well as inter-annual fluctuations of sulphur dioxide, which is more than likely the result of large-scale volcanic activity. It is probably the closest thing to “hell” in our solar system. A view of the landing gear of Venera 13 on the surface of Venus before it was destroyed by the high temperature and pressure of the planet (www.blogs.esa.int). In some previous articles, I reviewed the Lovecraftian Solar System, which included the planet Venus. At the time this was more of a general survey of the Lovecraftian Solar System and in the discussion of Venus I mentioned that we would discuss “In the Walls of Eryx” in more detail in a future article. I thought now would be a good time to discuss this tale. It should be noted that “In the Walls of Eryx” was written by both H.P. 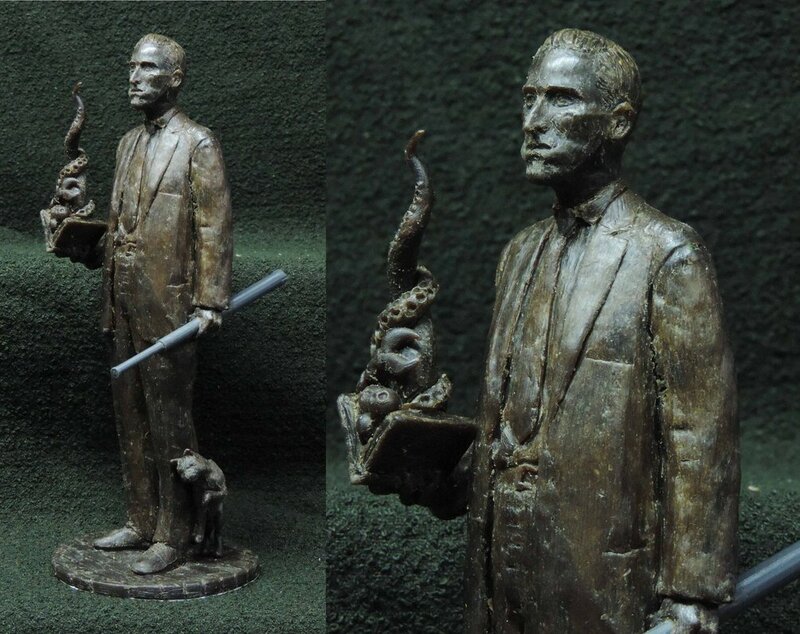 Lovecraft and Kenneth J. Sterling. Unlike some of the other “revision” tales, such as “Out of the Aeons” by Lovecraft and Hazel Heald, this story as not simply Lovecraft writing a complete tale out of a few ideas provided by the other contributing author. 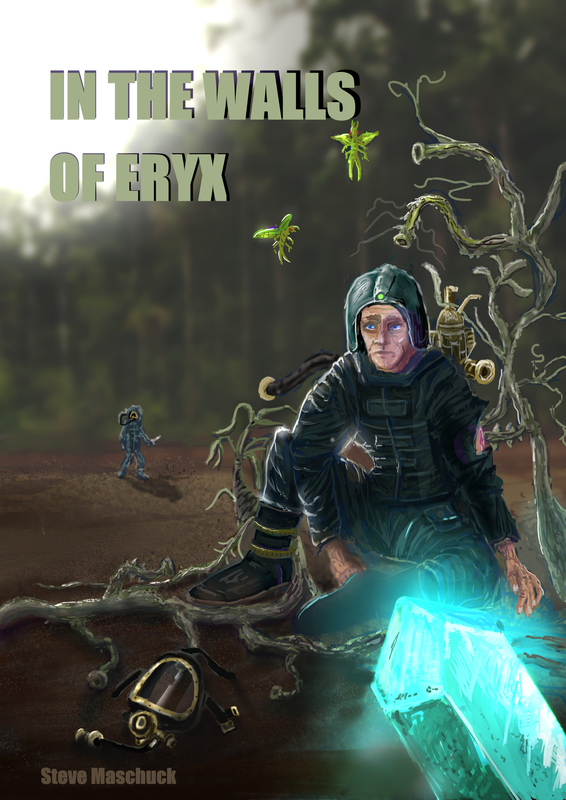 “In the Walls of Eryx” feels and reads like a highly integrative collaboration between Lovecraft and Sterling. ”In 1890 Prof. Schiaparelli asserted that the conduct of certain white spots on Venus indicate a long period of rotation, probably identical with the planet’s revolution about the sun, that is, 225 days.” This is from an article Lovecraft wrote on astronomy for the Providence Evening News, dated 29 May 1914 (Collected Essays, Volume 3: Science, H.P. Lovecraft; edited by S.T. Joshi; 2005). In spite of having this knowledge, in “In the Walls of Eryx” Venus has a slightly faster rotation than Earth. 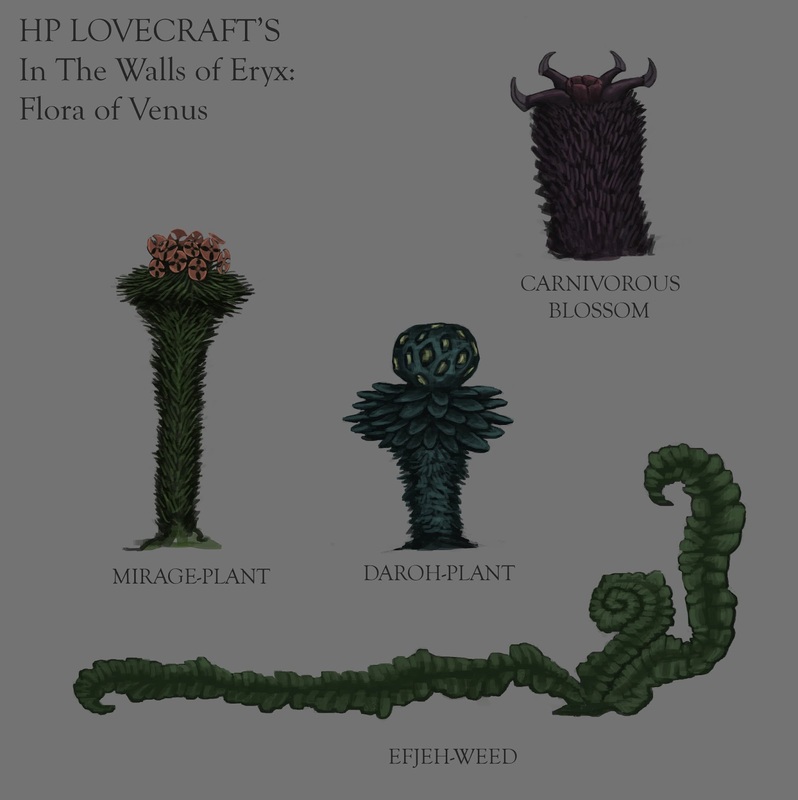 Based on Lovecraft Venus was a wet world covered in jungles, harboring leathery and tough vines as well as soft and rubbery vegetation. 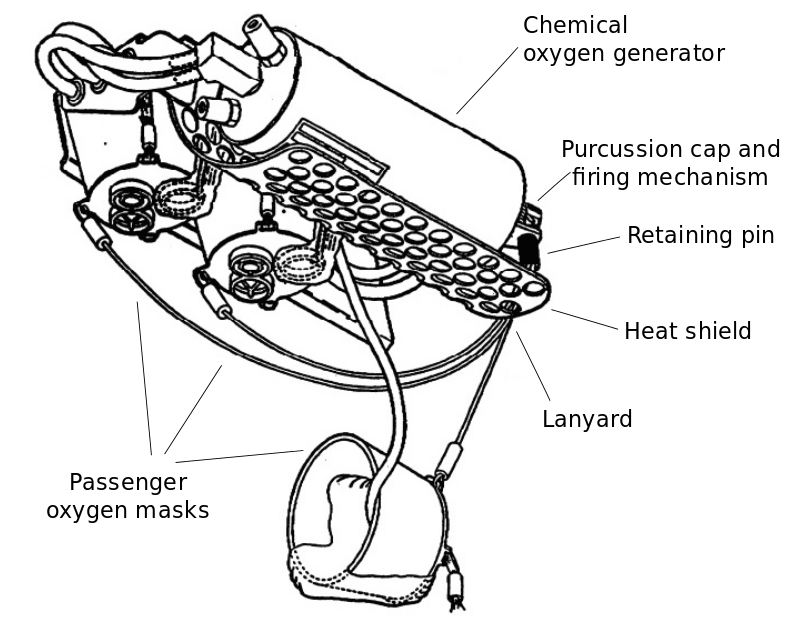 In spite of Venus being filled with large amounts of apparently photosynthetic organisms, there is an insufficient amount of oxygen to sustain human life, which is why oxygen masks are required. While the Venusian plants may be producing oxygen, the concentrations may be lower than those produced on Earth. However, this inability to breathe on Lovecraft’s Venus may be primarily due to extremely high concentrations of carbon dioxide, which appear to be a result of the extremely high amounts of organic decomposition of resident biomass as well extensive volcanic activity. Similar to these conditions, the atmosphere of OUR Venus is almost entirely composed of carbon dioxide (approximately 97%; The Planets by Dava Sobel; 2006). Later in the tale it is specifically cited that concentrations of cyanogen were high enough to kill a person on Lovecraft’s Venus. Cyanogen is a colorless, toxic gas composed of two carbon atoms and two nitrogen atoms. As early as 1868 the astronomer William Huggins identified through spectroscopic analyses that the tail of Halley’s Comet contains a variety of organic compounds included cyanogen. Since this compound is highly toxic many people panicked as the comet approached the Earth in 1910 and that our world was going to pass through the comet’s tail. 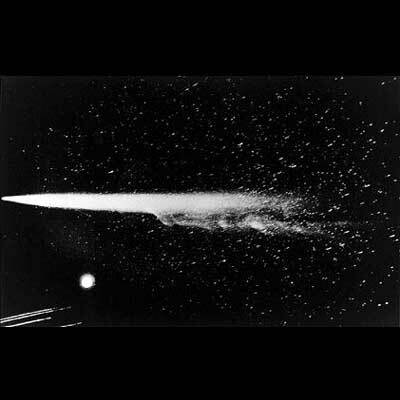 However, what many people did not understand at the time was that the tail of the comet contained such a diffuse amount of cyanogen that there was absolutely no health risk to the people of Earth (Cosmos by Carl Sagan; 1980). Lovecraft noted in an article for the Pawtuxet Valley Gleaner (dated 16 November 1906) on the upcoming return of Halley’s Comet in 1910 (Joshi, 2005) and while there was no mention of cyanogen, Lovecraft may have transplanted the dangers of this toxic compound from the tail of Halley’s Comet to the atmosphere of Venus. Later in the tale as the protagonist, Kenton J. Stanfield, is assessing how much breathable air he has left he cites, “I am using the chlorate cubes very sparingly.” More specifically, potassium chlorate. Again, Lovecraft is basing this on his knowledge of science, in particular chemistry. Superoxides, chlorates and perchlorates can produce oxygen when heated. While this exothermic chemical reaction generates heat, which could be a fire hazard, these compounds were used in to create Chemical Oxygen Generators. Within these Generators is a firing pin that is used to heat the chlorate compound and produce oxygen. In many of the early mission Soviet space flights potassium superoxide was used as the source of oxygen. Such systems were also used by firefighters and miners. The earliest patent in the United States I could find for a Chemical Oxygen Generator was filed in 4 May 1936. 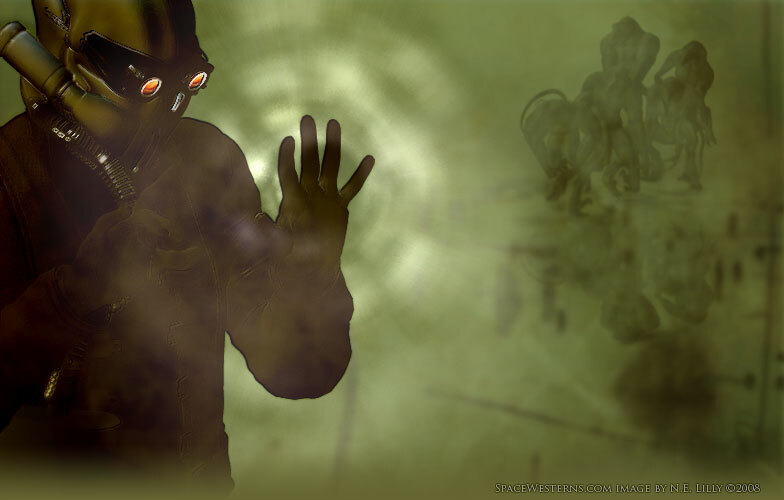 “In the Walls of Eryx” was written in January of 1936 so Lovecraft and Sterling may have gotten the idea for such a breathing apparatus from an article in the newspaper about this new technology. Or, maybe it was already being used but was not officially patented. In any event, Lovecraft and Sterling were certainly integrating cutting edge 1930’s technology into the tale. In contrast to the Chemical Oxygen Generators, the origins of some of the other technology discussed in “In the Walls of Eryx” are more difficult to pin-point, such as N-force barriers, lacol tablets which function as a water substitute and weapons called D-radiation cylinders. Still as with many of his other stories, Lovecraft made a serious effort to include the most up to date science and technology in his tales. Next time we will provide more details on what the Lovecraftian Venus would look like under its heavy cloud cover. Thank you – Fred.